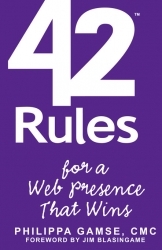 Cupertino, CA, October 22, 2011 --(PR.com)-- “42 Rules for a Web Presence That Wins” was created for business owners, executives and managers, associations and nonprofit organizations who want to understand what it takes to create and sustain a successful web presence. The book focuses on business concepts, issues, strategies and tactics for the Web, while offering readers a fast, but thought-provoking read that offers a unique perspective on the many different considerations for an effective website and social media campaign. "The rules may be less important than the examples! Some of the anecdotes are counter-intuitive and web 'ambassadors' will benefit simply by asking the questions implied by author Gamse's rules," said Vint Cerf, Internet Pioneer. "A tactical and practical guide to web activities that will help you avoid the pitfalls and potholes," said Guy Kawasaki, Author, "Enchantment: The Art of Changing Hearts, Minds and Actions" and former Chief Evangelist of Apple. The book is available from Amazon or directly from the publisher at 42Rules. Super Star Press will be hosting a free live webcast on October 26 at 9:00 am Pacific Time. Join author, Philippa Gamse, as she reveals her Essential Business Strategy for Website and Social Media Success, based on the book "42 Rules for a Web Presence that Wins." About The Author: A Web strategy pioneer, Philippa Gamse has been working with Internet applications since 1991. Originally from the UK, she formed her US-based consulting and speaking practice in 1995. Philippa was the sole featured expert for the cover story on effective Web strategies for UPS Compass Magazine Fall 2009, distributed to more than one million businesses. She is a Certified Management Consultant – an ISO-accredited designation recognized in over 60 countries. About The Publisher: Super Star Press, a division of Happy About®, was founded to help independent professionals establish themselves as experts in their field through writing, publishing and marketing books. The 42 Rules™ book series produces books that readers will actually read in the form of compact, high-impact books on personal and professional growth. 42 Rules™ enable authors to establish themselves as experts in their field through books. To learn more visit http://superstarpress.com/about_us.html. For quantity discounts, please contact the publisher, Mitchell Levy at mitchell.levy@happyabout.info - 408-257-3000.